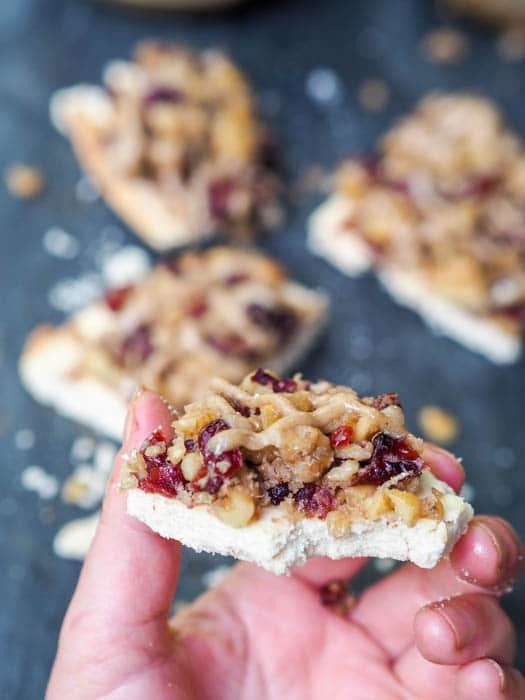 7 ingredient 30 minute Cranberry Shortbread Bars are topped with walnuts and date caramel for the ultimate healthier guilt free dessert. Vegan, Gluten Free and Refined Sugar Free. Everywhere I look everyone seems to be knee deep in holiday cookie baking. Everyone is posting about cookies, or wanting to eat cookies, or wishing somebody baked them cookies. Now, as a non cookie loving person, I’m currently feeling like a bit of an outcast. Personally, I don’t have anything against cookies – I just never grew up eating them, my mom never baked them, and I only learned about the classic chocolate chip cookie from staying at friends’ houses. But, to go with the trend, to get into that holiday baking spirit, I had to at least share some sort of baked goods, right? Last week it was my coffee pecan pie bars, and this week it’s cranberry shortbread bars. While I feel perfectly comfortable making all sorts of savory dishes, when it comes to sweets and baking, I have slightly less experience. This is going to change. I’m starting to experiment more with various flours, allowing me to make all sorts of different desserts that will be gluten-free, vegan and refined sugar free as well. If I’m going to be baking, it’s only for the healthier desserts. And that brings us to coconut flour. Have you cooked with coconut flour before? Coconut flour is a great grain free alternative to regular flour and is made from dried coconut meat which has then been ground. It is high in fiber and low in carbs. A win win if you ask me. One thing you need to know when baking with coconut flour is that it is super absorbent, meaning you don’t need much of it. As a general rule of thumb you’ll only need 1/4 to 1/3 cup coconut flour to replace 1 cup of regular flour in a recipe. 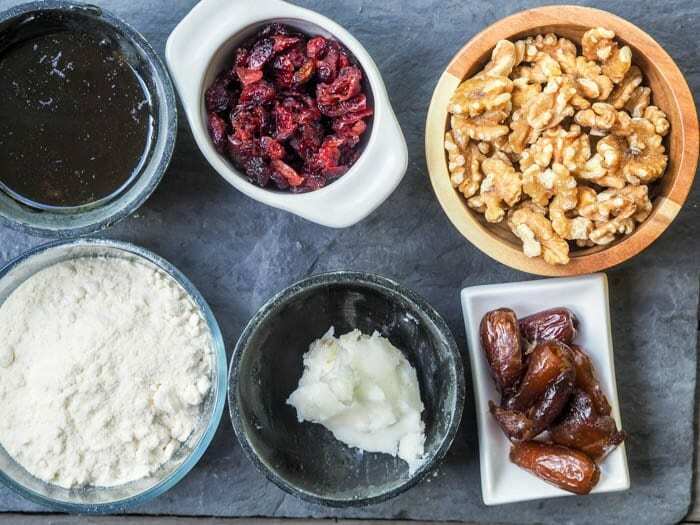 For all my specialty flours, nuts, and dried fruit I go to Nuts.com, a family-owned company selling with high quality nuts, dried fruit, snacks, and pantry essentials. They carry over 3,000 products including artisan and hard-to-find products as well as hundreds of certified gluten-free and organic items. And this holiday season they have been generous enough to donate hundreds of dollars worth of staples to my local food pantry as well as host a giveaway right here on this blog! 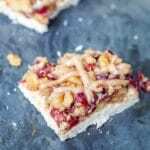 To make the crust for these cranberry shortbread bars you just need to beat the maple syrup and coconut oil until smooth and creamy, before adding in the coconut flour. Mix by hand and pat down into a baking dish or pie pan (if you’re me and do not own any rectangular baking dishes) and bake for 10 minutes. I’m telling you, this dessert comes together in no time! For the topping make the date caramel, by literally just blending dates in a high speed blender (see pictures in my caramel cheesecake post). For the star of these cranberry shortbread bars you’ll want to mix crushed walnuts with chopped cranberries, lemon zest and lemon juice. 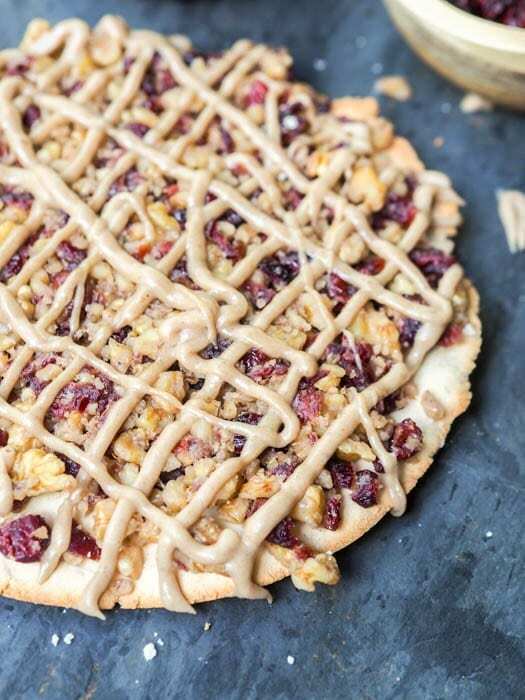 Once the crust is baked, let it cool, add a thin layer of date caramel, sprinkle with the cranberry walnut mix and thin drizzle more date caramel on top. 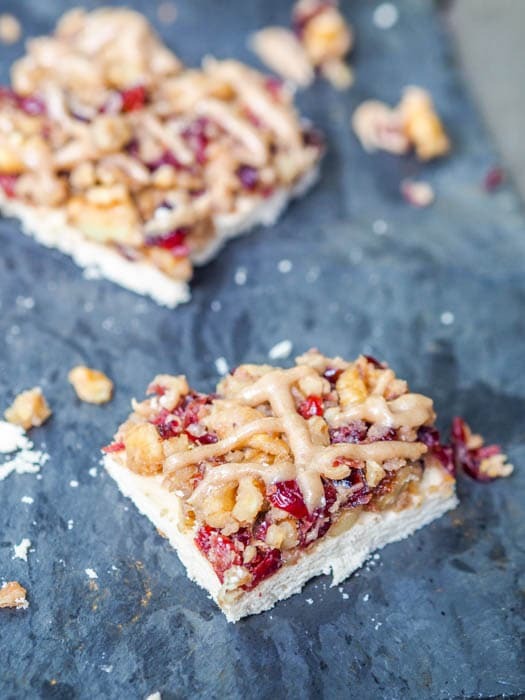 That’s all you need for these delicious cranberry shortbread bars with crushed walnuts. Cut into bars and take a big bite. I personally loved how delicate the coconut flour shortbread crust came out. With only three key ingredients the crust could not be easier to make. Walnuts and cranberries make a great combination – especially when mixed with lemon zest this made for the perfect topping. And then a drizzle of date caramel really tops things off! And now I’m happy to share a GIVEAWAY! Nuts.com is giving away $100 of product on their site. Be sure to enter below! In a bowl combine maple syrup and coconut oil. Beat until smooth and creamy. Add coconut flour and mix. Pat the shortbread crust into a rectangular baking dish or pie pan. Bake for 10 minutes. 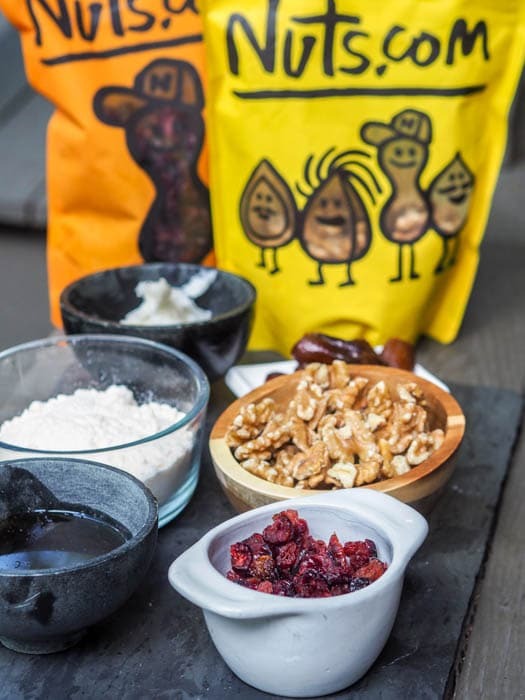 In a bowl combine walnuts, cranberries and lemon zest and juice. To make the date caramel - place dates in a high powered blender and process until smooth. Add a bit of water or coconut milk to thin it out a bit and help it blend, as needed. Allow the shortbread crust to cool. Remove from baking dish. Top with thin layer of date caramel. Top date caramel with the cranberry walnut mix. Drizzle date caramel on top. I LOVE Nuts.com – and sugar cookies! My favorite holiday dessert is peppermint chocolate pie. I like the pies that always come around during this season; pumpkin, apple, blueberry, etc. It;s always so beautiful to see these desserts on the table. One of my favorite desserts is the simplest: My grandfather always ate brick cheese and watermelon for dessert. The refreshing, sweet melon and the salty cheese is an enduring taste memory. Sugar cookies are my favorite during the holidays, which is interesting because normally I prefer chocolate desserts. My fav holiday dessers are the pies. I love any pie. I would make christmas cookies! My favorite holiday dessert is white chocolate Christmas Crack with cereal, pretzels, M&Ms, peanuts and white chocolate. Coconut oil fudge with pecans and cocoa nibs. My favorite is cherry cheesecake. My favorite holiday dessert are my moms cinnamon streusel muffins she makes every christmas morning. My favorite holiday dessert is German Chocolate Cake. My favorite holiday dessert is pecan pie. I adore my Dad’s divinity. He is not a cook but always made the best divinity. Cherry Pie is the dessert for me. So good. My favorite holiday desert is pecan pie with whip cream. My favorite holiday dessert is pecan pie… It’s sinful. pumpkin pie is the one for me. I love but clusters (peanuts & mini marshmallows in chocolate)…YUM! Pumpkin pie is my fav!!!! My mom’s little nut roll cookies. They are so much better than the normal nut roll but it kills your back rolling out all the little balls. Of course I have to quadruple it because everyone loves them. Haven’t made them in years, I think it’s time to make some again. Miss you mom! Banana pudding is my favorite. pumpkin pie with whipped cream is my fave! My favorite holiday dessert is pumpkin pie. I always loved my grandma’s peanut butter fudge…She made it so yummy! We love Pumpkin Pie for Christmas and Thanksgiving.With Coolwhip. Favorite holiday dessert are the Christmas cookies we only bake during the holidays. My favorite holiday dessert is apple pie with plenty of whipped cream. I absolutely LOVE that these are VEGANNNNNNNNNN!!!!!!! Homemade coconut cream pie, yum! Holidays sweets make me want Sticky Toffee Pudding. I love Cherry Cheesecake. My mom always made it and it is my favorite. I love Pecan Pie around the holidays. Pecans, Pecan pie, pralines, and walnut fudge. I didn’t used to care for nuts in my youth but I love them and their health benefits now!! oh and brownies with walnuts!! Looks delicious! 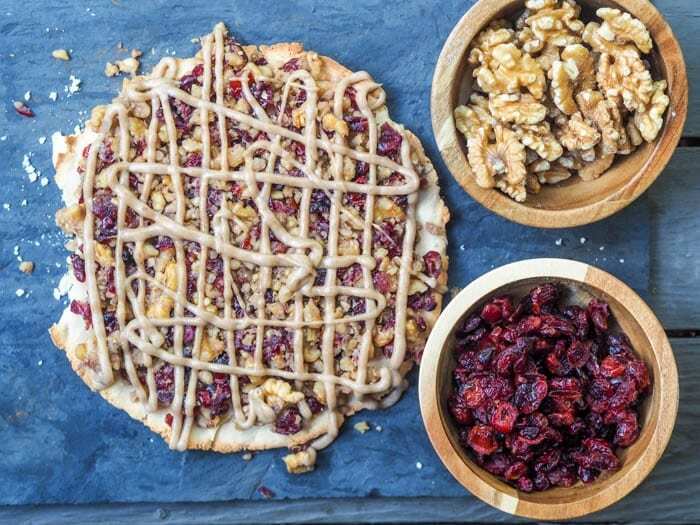 Cranberry & Walnuts are two of my favorites! My all time fave holiday desert is peppermint bark. So yummy. My favorite holiday dessert is Pecan Pie! My favorite holiday dessert is White Christmas Peppermint Layer Cake that I love to bake with my kids. Happy holidays! My favorite holiday dessert is homemade cheesecake! My favorite Holiday Dessert is Eggnog Cookies! My wife is Syrian and we have Bacalava. Her grandmother used to make it but we buy it premade these days. My favorite holiday dessert is pineapple cake. My sister makes a nut pound cake that is out of this world! It’s my favorite. My favorite holiday desert is pumpkin chocolate chip cookies. Unless peppermint hot cocoa counts, that’s my fuel all December! My favorite holiday desert is pecan pie. Pecan Pie is my favorite holiday dessert. Too many, but toffee is one of my favorites! My favorite holiday dessert is fresh coconut cake. I absolutely love chocolate crinkle cookies!! Shortbread cookies are my absolute favorite! It’s all about the cookies right now!! Peanut Butter Blossoms are my favorite. Pecan pie is my favorite holiday pie. My favorite holiday dessert is Black Forest Cake.